Save an extra CDN$ 9.17 (34%). Buy the Kindle Edition instead. 1676. In a hovel in the centre of Paris, the fortune-teller La Voisin holds a black mass, summoning the devil to help an unnamed client keep the love of the King of France, Louis XIV. Three years later, Athénaïs, Madame de Montespan, the King's glamorous mistress, is nearly forty. She has borne Louis seven children but now seethes with rage as he falls for eighteen-year-old Angélique de Fontanges. At the same time, police chief La Reynie and his young assistant Bezons have uncovered a network of fortune-tellers and poisoners operating in the city. Athénaïs does not know it, but she is about to be named as a favoured client of the infamous La Voisin. 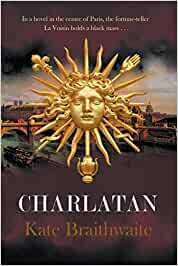 Start reading Charlatan on your Kindle in under a minute. 5.0 out of 5 starsAmazing! Definitely recommended! Historical fiction is my new favourite genre. Kate Braithwaite's writing is so rich. The detail and descriptions transported me to 17 Century Paris. Every page held me and made it impossible to put down. The desperation and the evil underbelly of France's nobility was shocking and satisfying at the same time. A must read. With vivid descriptions of the glamour and opulence of 17th century France, author Kate Braithwaite has written an impressive novel that brings her readers into King Louis XIV's court. It is a place filled with deception, carrying favour, scandal and intrigue. When new revelations come to light concerning the use of Dark magic, panic ensues within the court as certain people are threatened to be prosecuted for witchcraft. Police attempt to figure out who is dabbling in the Dark Arts and will not stop at mere interrogations but have resorted to torture and even public executions in order to remove any suspicion or threat of sorcery from the king's court. When they focus their investigation on Catherine Montvoisin, a woman known for providing Dark solutions, it has a rippling effect among not only the nobility but those further down the social food chain. This is a time of greed, corruption and climbing the social ladder where being in or out of favour with the King of France brings different kinds of danger. There is mystery, intrigue, sinister plots and a rather large group of characters. The story lines are reasonably intricate without being too fussy or overly verbose but seem to have a rather narrow scope. At the heart of the book there are two different story lines. One follows Philippe Bezons, the young assistant to the chief of police who is eager to prosecute Montvoisin but not if it puts the woman he loves at risk. The other story line follows Athenais, the aging mistress of the King, who is suspected of using Dark magic to maintain the King's attention. It is her story that I found most compelling and to whom I was most sympathetic. I will admit that it took me a little bit to get into the story but once it got rolling I was quite engaged. The one criticism I had was that there were so many characters, many of whom are secondary, within the two story lines that it was sometimes difficult to remember the specific traits, history etc of different characters and to keep track of who was who. Readers will be impressed with the writing in this novel. Braithwaite's writing is so descriptive that you can clearly imagine the beautiful gardens and ornate surroundings of the grand palaces as well as the truly decrepit and fetid conditions of the Chateau de Vincennes, the overpopulated prison where some rather graphic torture takes place. There is a lot going on in this book but Braithwaite has woven an intriguing story. It is clear that she has done a lot of research on this era. Since I typically don't read much historical fiction centred in France I was pleased to learn that many of the characters in her book were based on real historical figures with a touch of fiction to bring it all together. Might as well learn a little while enjoying a suspenseful read, right? This is a book that focuses on what people will do in order to achieve their deepest, and sometimes, darkest desires. It's a book about maintaining power at any cost as well as the impact of fear and jealousy. Fans of Jane Johnson (Pillars of Light) and Sally Christie (The Sisters of Versailles) should enjoy this book. Disclaimer: My sincere thanks to author Kate Braithwaite for providing me with a complimentary copy of her book in exchange for my honest review. Historical fiction has a higher bar for me. Not only do I need riveting characters that wheedle and panic and scheme; I need to smell the powder on their wigs and see the sores on their faces. Not only do I need a gripping plot filled with intrigue and peril, I need to feel the heat of the execution pyre and the motion of the royal carriage as it rolls across the countryside. The book is populated with characters that are infinitely compelling in their hideousness, but also sympathetic. An ambitious young investigator’s idealistic search for the truth uncovers a web of sorcery and witchcraft that stretches as far as the court of Louis XIV and then, in a breathtakingly revolting twist, threatens to ensnare him as well. As much as I cringed for the young officer, however, my heart was with Athenais, the magnetic but aging mistress of the womanizing King. Athenais resorts to black magic not only to retain the King’s affection but also to save her position and the future prospects of her children. What a fascinating peek into the dynamics (and limitations) of female power in the court of Louis XIV. For readers who like a side of actual history with their fiction, you’ll be intrigued to find that many of the characters in the book are real. There’s nothing better than learning about historical figures and events through the eyes of a talented storyteller. Set aside some time after you’re done reading to do some serious Wikipedia browsing. You’ll be surprised how much richer the 17th century seems now that you’ve spent time in Braithwaite’s Versailles. 5.0 out of 5 starsA great pick for a book club! Historical fiction, Paris, the French Court, and gorgeous writing-can't go wrong! Enjoyed this historical novel immensely. Kate uses wonderful detail and an intriguing story line to keep you interested in the skulduggery of French court life. Found the book interesting and provided insight into a part of French history not known before. Highly recommended reading this book as you are transported back in time and feel as though you are witnessing history through the author's eyes. This is a marvelous novel and I hope this new to me author writes many more! Wonderful book, with an intriguing plot and well drawn characters. Well written and richly detailed, I loved this book!